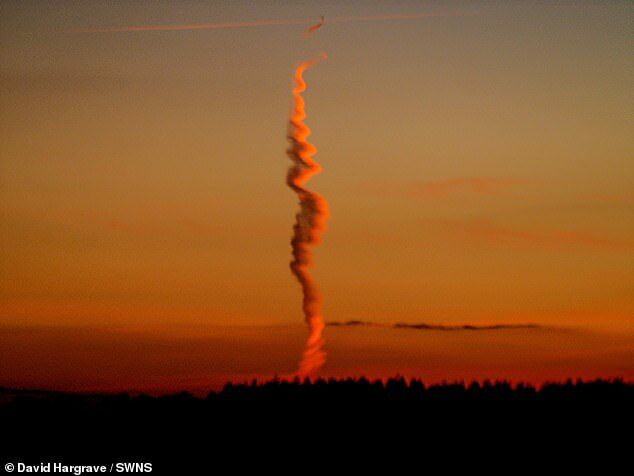 A strange spiral cloud that resembles a jet's vapour trail has left experts baffled. Nobody can work out how the trail was formed, with the mist seeming to billow in from an MoD testing range near Stonehenge. University weather experts and MoD officials have all been left scratching their heads while trying to work out what the mist is. The incredible photo was taken by David Hargrave, from Sidbury Hill on Salisbury Plain, on Tuesday night. He was walking his dogs when he noticed the vapour trail, which also looks like the aftermath of a rocket launch. It appeared to have been tainted red by the setting sun. David said it was about 30 miles west of where he was, in the direction of Westbury at the north-western edge of Salisbury Plain. Land nearby is an MoD testing range where heavy weapons are trialled and soldiers regularly train. Calls to the University of Bristol and Somerset Drone experts Atticus have been made, but no one is any wiser as to what exactly it was. The Defence Infrastructure Organisation, part of the MoD which operates the plains, is not aware of any military training which could have caused it. Last edited by Blackleaf; Feb 9th, 2019 at 06:55 AM..
Did it smell like, I don't know ... ganja, perhaps? The best I could ever do was candles on balsa wood strips tied under those light dry cleaner bags that they use to protect your clothes. Whenever Chinese lanterns fly over here people think they are alien spacecraft. Surely the greatest prank ever was the 1809 Berners Street hoax. My reckoning is that the mysterious cloud has something to do with the Cranfield Ordnance Test and Evaluation Centre (COTEC), which tests munitions and weapon systems and pyrotechnics on behalf of the MoD and others. It's at Gore Cross on the edge of Salisbury Plain. Except for the one that dropped out on us and started a field on fire. That took some explaining. It's some sort of a rocket trail. It's right over the biggest gunnery range in England. Connect the big dots, for gawd sake. Oh, and don't forget that huge "Brexit" hoax about it fixing anything.